Recently I've painted at two parks where I haven't painted before. 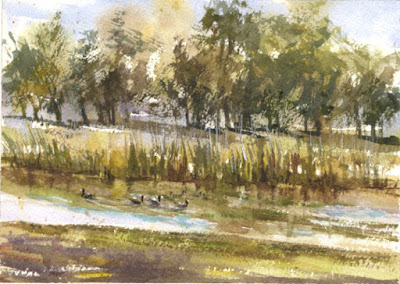 Just yesterday the Saturday paint-out group visited Almansor Park in Alhambra. I've driven by many times but never visited or painted there. 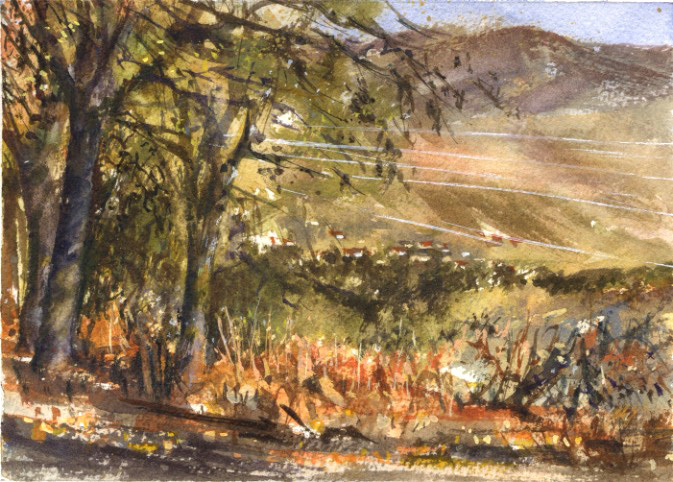 It was really wonderful to be there to paint between the rainstorms we've been having. There is a duck pond which was full of mud hens (coots). There also were some wigeon ducks and loud Canada geese. In November we painted at Oak Grove Park in Pasadena. I've been driving through this park to get to the lower Hahamongna Park but this time we stayed in Oak Grove. These parks are busy on weekends but I was able to find a great view of the mountains and distant homes. It would be fun to try these pieces again. There's always something to fix or try another approach.